Just got on the ferry for a 2 hour crossing to Dunkirk . Then head though Belgium and Holland on are way to germany for the world championships. PS . Cheers Mark P we got the motor in time thank you . Good luck to Team GB and I hope you all have a great week. the Greeks at the RC Bike Worlds 2016! So... the long report is coming! Grab a beer and have time! Wednesday, August 10, day 1. A bit crazy day for our start of the RC Bike Worlds. It started with rain and cold! When I say cold, I mean 12C!!! And rain. Let’s not forget! Vasilis, practically didn’t do his first Timed Free Practice, since it was his first ever run on this track and it was raining hard! I managed to prepare my bike for the wet conditions while my heat was running, so I decided to run, even starting at the 4th minute of the heat. I did 5 laps! My heat is the 5th, while Vasilis is racing in the 3rd. We did the 3rd TFP but Vasilis was unlucky. He ran on a wet track, while after his heat, the track started drying fast… Some were lucky to race in dry conditions. In the afternoon, the weather turned crystal clear and warm, so there was the classic Opening Ceremony with all National Teams parading on the track. The concourse d’ elegance for the most beautiful body started well for us, when the ladies in charge picked both our bikes for the preliminaries. After that, though, some kids discarded us and proceeded to two best bodies, one of which was truly beautiful. It belonged to Thomas Feilner. After the banquet, a stunning helicopter show had us wowing for a long time! Later on, TF had organized a stripper show (oh yea baby!). Thursday, August 11, day 2. The first day of the Qualification runs today with somewhat warm weather and sunshine. No relation to the Greek weather, however, which, as I was informed by my family was a nice round 36C!!! Vasilis has found his rhythm on the track, being very flowing, so at last, he is happy driving! In all three Q’s he did very well, lowering his best lap times every time: He started doing 30’s, and ended down to 27.8! I did a good first and second Q, which for the moment had me as high as 17th overall. During the 3rd Q., however, the bolt of the front wheel axle went away, so I had to retire. 25th overall!!! A few issues were discussed at the TM meeting. One of them, serious too, was about which TFP’s would count. The five ones done on Tuesday, all in dry conditions, but not with all drivers present yet, or the wet/damp ones of Wednesday? From what I gather, it was decided to count the dry ones and the drivers who arrived on Wednesday should be placed where they belonged, according to their last WC standings. So, me, and Vasilis were placed in the 4th and 5th heats respectively. As far as the weather was concerned, as I said, we did the first 3 Q’s in dry conditions today and hope for the best for tomorrow, since the weather forecast says rain, again! However, we expect the weather to be dry and sunny again on Saturday, so I hope we will enjoy driving. (You can still watch the racing on the above link. It’s more than 4 hours long!). Also, there’s a nice German site, at www.mikanews.de which has a million pics of our racing, and they keep updating every day! Friday, August 12, day 3. We already knew since Thursday that today would be wet. So we prepared our bikes for small lean angles, with long scratchbars, rain tires and good waterproofing. The laptimes are quite slow for everyone, since no one is really pushing hard in the wet and we all try to avoid that slide that will send the bike out of the track. I go slowly, and as carefully as I can, but I can’t manage anything good. But… we have good excuses: The tires we are using are GRP R1’s which I had since the WC in Sweden. Yes, I had them sealed and in dark places, but still they are old. We decided it was not worth it to buy two new tire sets plus the very expensive Magic Rain spray. Anyway, the weather forecast for Saturday was promising sunshine and warm temps. So… do all this expense for just three runs? In one of these heats, I did a very good 20-lap race, running the rain tires, long scratchbars and the track was drying every minute! So, we end up in the C main, me in 4th position and Vasilis in 7th. Or, 24th and 27th in the general classification of Stock Class. Saturday, August 13, day 4. The day at last, starts dry and sunny! We run the first heat of our final on a drying track. It’s the first run of the day actually, at 8.30 am. Vasilis, wisely, mounts long scratchbars, for his peace of mind, but he also cooks his GRP M3 (dry) tires, to 70c for half an hour. By driving fast and carefully but not taking big risks, he manages to finish 3rd! I, on the other hand, decided to play it brave, and mounted shortish scratchbars, thinking that it is actually drying. Well… I was proven wrong! It was drying, but not as fast as I wished, so I did my fair share of crashes (huge slides, really!) and I finish 6th. At the start, I manage to find myself leading right after the first corner, and I make a good distance ahead of the two very fast German drivers who were ahead of me at the beginning. Vasilis, also, managed to make a difference and finishes a nice 3rd position, again! Staying calm, and not crashing, I manage to finish first, doing 21 laps, while Vasilis is at 20 laps, also doing a respectable 27.7 best lap. At the 3rd heat, I crash in the first corner and being marshalled last, I charge forward passing almost everyone. At some point I have a very clear track in front of me, still charging as hard as I could, and I hear Thomas Feilner saying I am 1st! It’s already the 5th minute of the race, so I hang on, try not to crash, slow down a bit and make it to the finish line first! Even when I was reaching a slower driver, I would just wait patiently for half a lap before making my move in complete safety!!! Vasilis pushed real hard this time, but he had a couple of crashes and finished 5th. So, having two wins, I am first in the C-Final! Wow! For the record, Ciccacci, last year’s World Champion, won the Nitro bikes class, driving a Nuova Faor bike, and finishing a couple of meters in front of Martin Hahn, who was leading the race for most of half of the duration! In the SBK Class, Antoine Brunet, driving an RG Evo BK1R bike, won every heat of the A-final, very convincingly, making this his 2nd WC. In Stock Class, last year’s World Champion Fabio Tosti, won all three heats as well, being unbeatable in every heat he ran in this WC! A little later, we did the Prizegiving Ceremony, with champagnes for the A finalists and beautiful trophies for all the winners! A few hours later, an international party of English, Austrians, the (one and only!) Serbian and Greeks, were having dinner at the local Mexican restaurant! Among us was a former World Champion, the 3rd in an A-final! All a good party, together!!! Sunday morning, we left for the Berlin airport, arriving at home at around 6 pm. Vasilis had some more travelling to do: He picked his family and drove another 350km’s to the sea! Lots of travelling today, indeed! So… now… we prepare for our own Greek MotoGP, at September 24-25, in which we will have a couple of surprises, hopefully! OK, I will tell… We will have a brand new 2016 bike (actually, the World Champion!) and most possibly some international visitors to race with us!!!! Excellent report as always Stelios. Thank you for sharing your experiences with us and well done on winning your final. If you can't beat them, arrange to have them beaten! In short it was a fantastic experience, to actually witness how good the top guys are in all classes is a thing all of it's own. I'm naturally biased towards the nitro guys and to see Marco and Max 'steering' a bike with the back wheel was quite a spectacle! 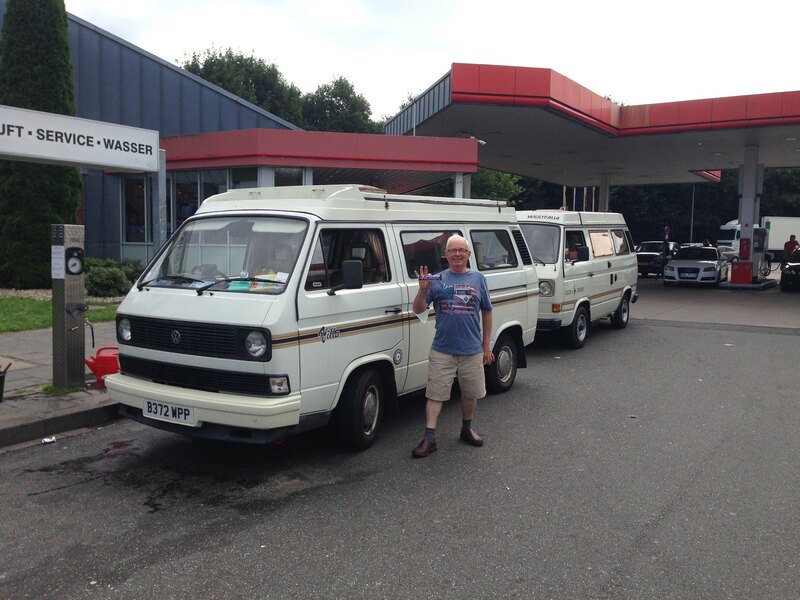 From start to finished everything went fantastically well, there were moments where the camper didn't start on the ferry and the huge delay on the German autobahn but all this was forgotten when we landed at the track, albeit a day later than planned! The Leipzig track is awesome, one long straight with a fast bend leading onto it and a tight bend at the end, very rewarding when you get it right, which did take some time and was never really mastered, certainly not by me! My fellow Brits had there own trials and tribulations both getting there and during the weeks racing the worst of which was Ken and John seriously damaging there bikes, but were soon back in one piece after a busy session in the pits. Everything did get rather interesting when it came to the finals, the 3 of us British nitro guys ended up in the 'A Final' which meant we were grouped with the top guys, from this the top 5 went forward to the 'Main Final'. The remaining 5 drivers came from the 'B final' which was run prior to us. I managed to finish 6th and was a little disappointed to finished 11th overall just missing out of the top 10. The 'A final' was one of the most hectic races I have ever been in, not only were the best in the world on the track but we had fuel stops to do and if the worst was to happen the tricky task of starting our stalled bikes. Neal and Peter stepped up to the plate and did us proud, Peter did a fantastic launch when the flag dropped and then saved the day when my bike stalled. All in all great team work! Thanks guys! This was the first meeting I had properly practised at, that is, adjusting the bike, tuning the engine, suspension, brakes, and the results were great, getting faster and faster before finally breaking the 30sec lap time! My bike performed very well but was effected by the changing weather conditions the super hot weather actually caused my bike to run very rich and caused the engine to run backwards at times which was less that ideal at the start of a nitro heat! Thanks to all the Brit guys that made the worlds fantastic, John, Ken, Peter, Neal and Simon and a big thank you to my dad for putting up with my driving on and off the track and for a magic time away! What remains to be seen is John V's story and of course his photos!! !